I know, I know ... why am I posting photos of snowy birds when I myself flew the coop during Saturday's brief storm and headed down to Anna Maria. It's not that I'm trying to rub it in that we escaped all that cold weather. I hear it is down right balmy in Philly today with the temps in the 50's. But ya gotta admit, this little female cardinal was so sweet. How can you not have a crush on her! but one of my all time faves). Our plane was a bit late in taking off ... we spent some time getting de-iced. And I'm all for taking as much time needed to de-ice my plane! Well, not MY plane, but USAir's plane. It was dark when we arrived, but my Sunday morning walk was gorgeous! And that was just a morning walk! some fun with my edits. and the scenery photo was edited with Nik HDR-End of the Road. Well, I gotta go ... the outdoors is calling me! you're doing a great job with your photos all the way around! enjoy yourself! I'm loving the edits. Beautiful shots! Oooh I'd love to be by the sea right now, have an amazing time. Beautiful shots -- totally enjoyed them! 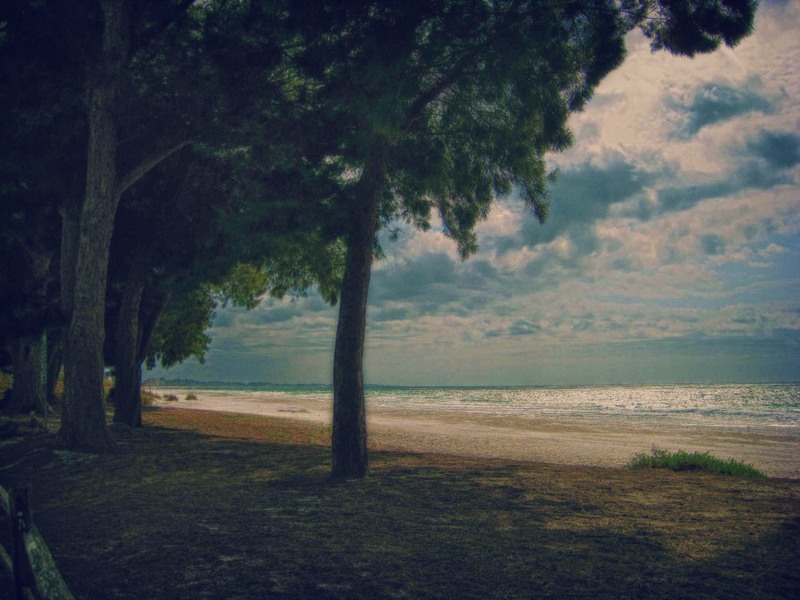 You are the Birdwoman of Anna Maria (or anywhere else for that matter)! Your photos are just amazing and that little cardinal gal is the best! Thanks for sharing the editing features. It feels like I escaped winter right in the middle of this beautiful post. Gorgeous birds. Oh! that beautiful red cardinal in the top pic just tugged at my heart strings.... can you get a prettier sight than that...then my walk along the beach topped off the morning. Delightful! Your cardinal pictures are wonderful! Well, actually ALL of your photos are...I just love cardinals! Not fast. Honestly, it's pretty yucky here. 40ish, raining, and so damn foggy, you couldn't see the birds with a spotlight. Ok, not really that foggy, but kinda sucky. Your photos, on the other hand, are not sucky at all, thanks for sharing the warmth and beauty! I can appreciate a woman who understands flight, as freezing weather is not something the general public has a clue of while impatiently complaining about flight delays. It's serious business, so much so that to ice to pilots is like fire to sailors during the time period when all boats were wooden. Well, that's quite a transition -- I like the flight theme. 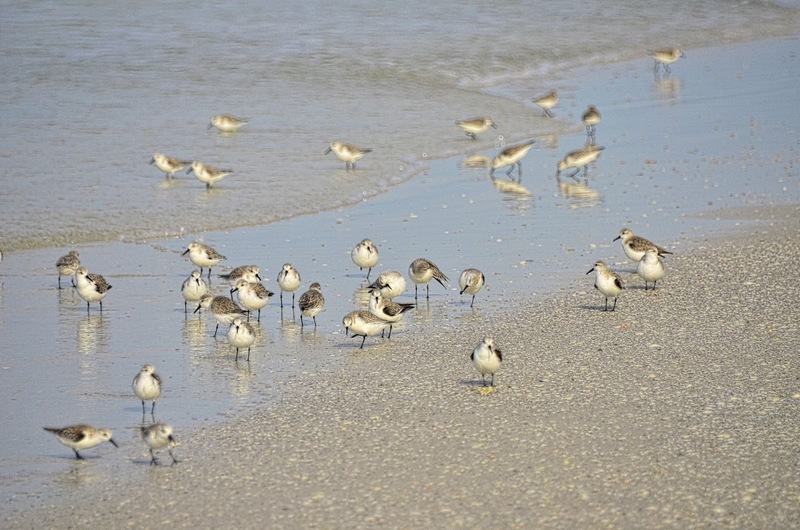 I have to admit your winter birds are lovely, but the beach is what captures my attention...trying not to feel jealous. Enjoy it for the rest of us stuck in the cold. The pelican is awesome too! I love it when photographers try new things. Love the effects and I fell in love with the cardinal from the shot. Fantastic job with the edits and what gorgeous birds! I love them all -- particularly the cardinal! Sounds as though you're having a great time, wonderful shots from the beach! Enjoy your week, Reena, and take lots more shots!! Gorgeous. From winter to summer. Beautiful walk. That is a wonderful juxtaposition of feathered friends. I especially love the Cardinals, though, being from where it is the state bird. 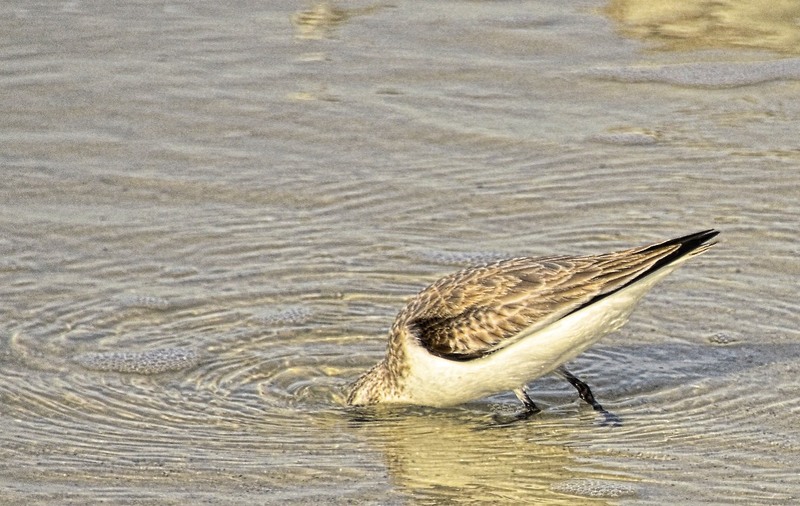 And the water birds - well now - wah! I just miss the beach. The cardinal pictures are gorgeous and that first picture from your Sunday morning walk just took my breath away. Holy cow, I enjoyed this walk sooo much that I'm just going to have to come back for a visit again later. Really, really wonderful photos! Gads!!!! You've done it again!!!! Stunned me. 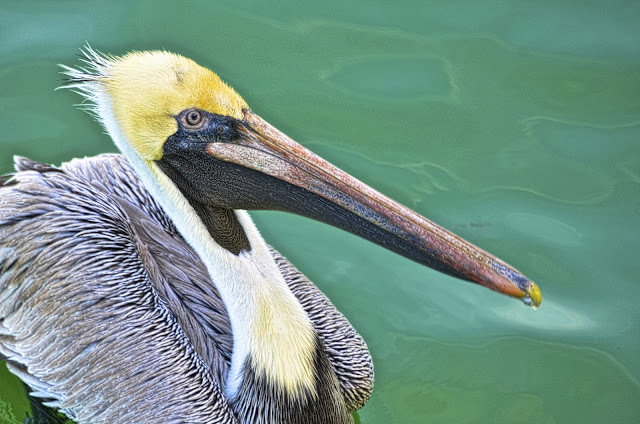 Did you see Sandra's pelican pictures she edited? I have been framing them to hang up, and I have to ask you, can I print out two of these pictures to frame and hang on my wall??? I am in LOVE with them, you know I am a birdwatcher! When I am done, I will e-mail you a picture of it! The ones I want are nine and ten. I think they are a pelican and a cormorant? Have a great week, Reena! How the heck do you get those birds to pose for you??? ;-) I've already told you that I'm envious of your southern escape. Yowza on the editing!! especially that bokeh on the bird with the wings spread out! Cardinals are such beautiful birds, both in form and coloration. Great captures of them! 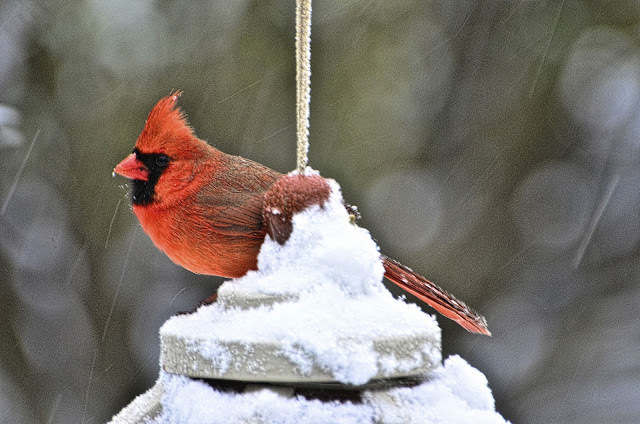 Love the cardinal with snow on it. Winter birds have it tough! Oh my goodness, lucky you Reena! It is much warmer here today, but surely not as warm as where you are! 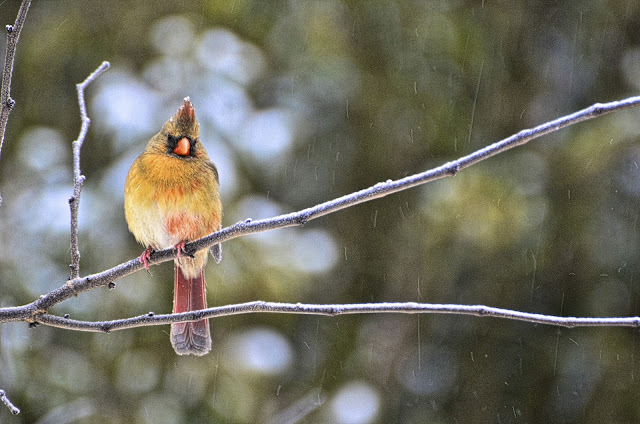 I love these photographs, especially that sweet little female cardinal. Just beautiful! Thank you so much for sharing with us at The Creative Exchange this week. I like how you just flew those Cardinals in there and flew of yourself...I would have been seriously nervous with the ice thing!! Love your Cardinal and your walk photos ...just lovely !! just stopping by to enjoy water and bird pics. 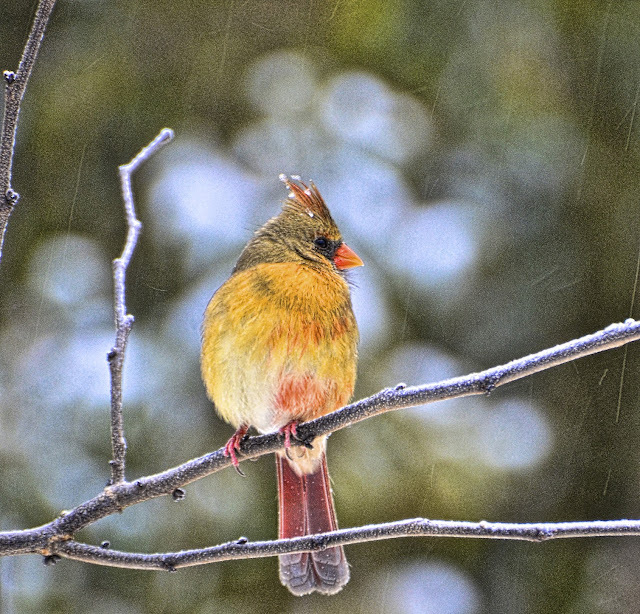 The cardinals are beautiful with their snow covered coats, especially that little female. Wow - love the contrast between the snowy birds and the warm ones! Rarely see cardinals here so I thoroughly enjoy those photos of them. Enjoy your trip. I envy you the beautiful weather! Jealous .. I wish I was there ..
Beautiful shots from both locales. 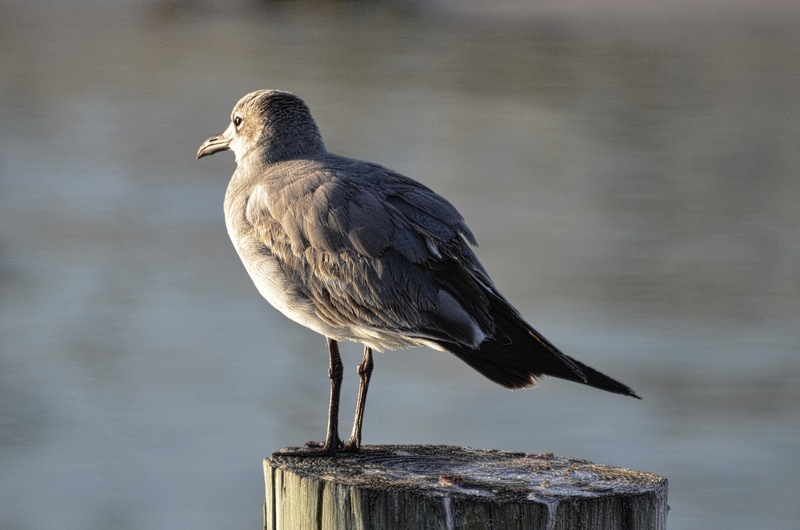 Love the bird photos. We saw a long heron while out walking the other day. We both took several photos of the heron from different angles. Was nice to see him up close. From the snow to the beach.. I am so jealous.. You shots today just make me smile.. They are fabulous.. Have fun and enjoy my friend..
Gorgeous photos, Reena! I would actually like to see some snow. Our winter has been very mild. Number 1. Yes, I admit to a huge crush on the the female cardinal. 2.You pictures are brilliantly processed. The ricocheting rain drops flying around your song birds are way over the top AAA+. 3.A great final line..."The snow turned into rain." Then the sax solo takes it out...just drippin' with "Ah, what might have been" nostalgia. 4. Agreed, you are crushin' it! Wow, what a varied tour!! Boom & Gary of the Vermilon River, Canada. I enjoyed both sets of photos immensely! 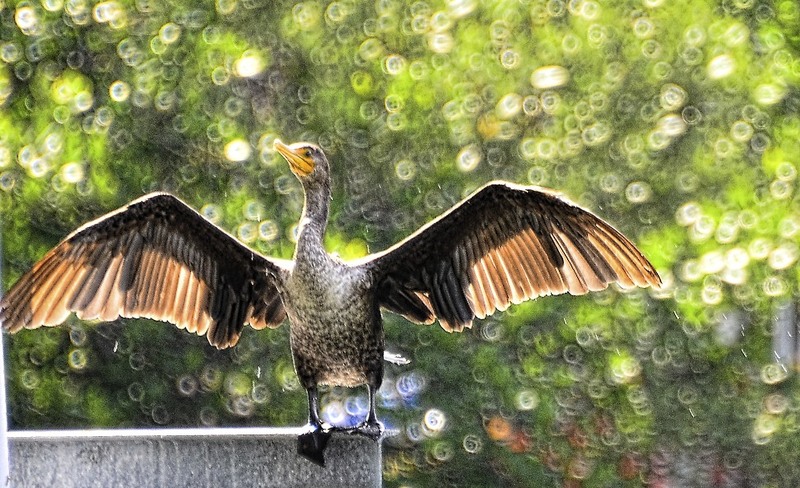 Love the crazy bokeh behind the cormorant. Wow. Hey Reena and thank you for taking me on your walk along the beach. Finally we have sun and warmth today. Madi hasn't had a sunpuddle nap since last Friday morning. 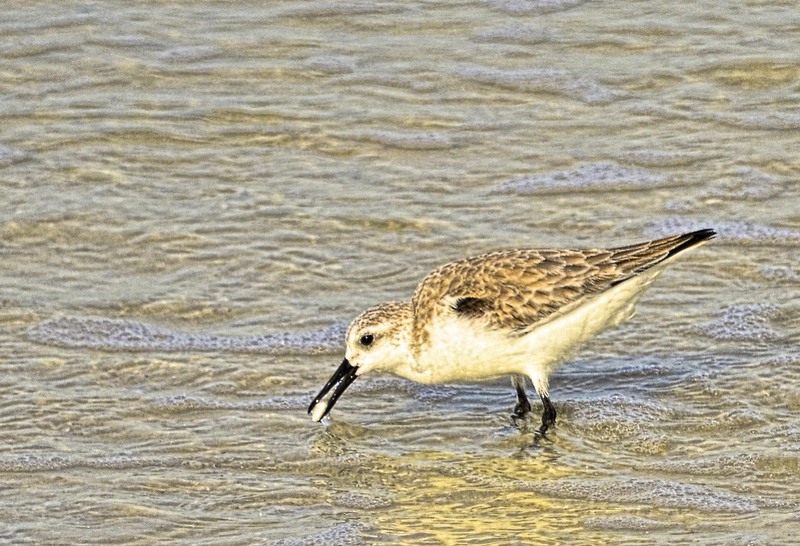 Great photos of all the birds but I'd prefer to take the shorebirds and seabirds too! 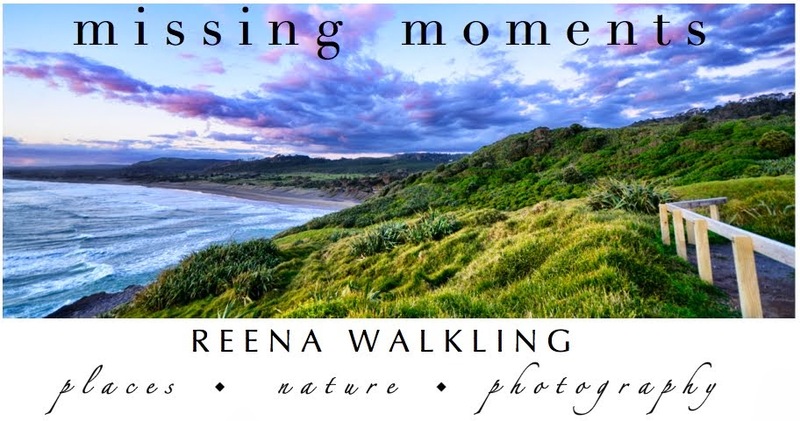 wow, reena, your photos look magical! Beautiful shots, great use of textures! 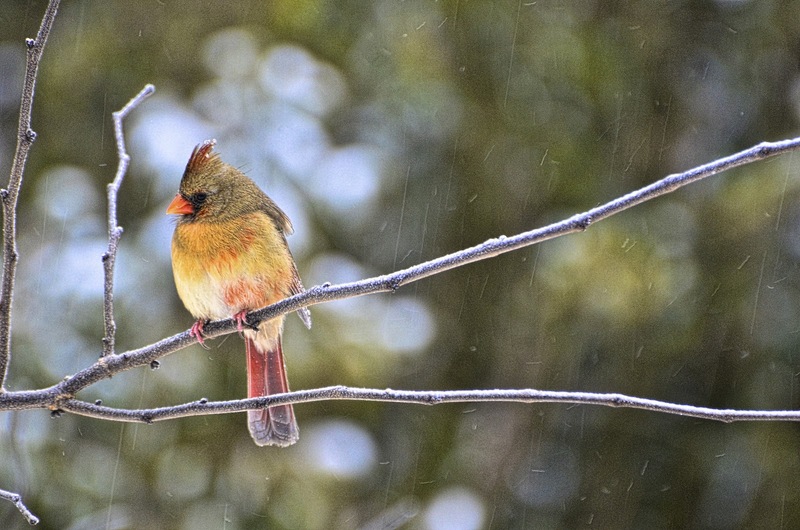 Love the female cardinal shots! Beautiful job with the treatments. That Commorat with her wings out is beautiful. Hi Reena, I love your beautiful Cardinals in the snow. Enjoy your trip to Florida, I am envious. I wish I could skip the cold weather and migrate south. Wonderful post and photos. Cardinals are one of my favorite winter birds ...next to the little chick a dee. the pelican with the majestic wings spread and the blurred green background is special. I really love your Cardinals! Especially the ones on the bird feeder. Wish I had such beautiful birds in my yard. What grand opportunities you have. At first I could not understand how you could leave those superb, snow-clad cardinals but seeing he photos of your walk and especially the pelican, now I certainly have at least an inkling. Wow, amazing images...I love your editing, the pelican is just gorgeous. Hi there - great set of pictures. I really like the 'rain lines' in the first set. The water may not be too warm - but it’s nothing that 3mm of neoprene can’t fix! Hi Reena, to answer your question - not that you need any help from me as your shots are amazing - Lighting (which in this case was dumb luck; when shooting outdoors, you never know what you're going to get) and aperture. I used f9 for the chickadees. My D3000 creates noisy images even at ISO 800, so it is a real challenge to raise the aperture on cloudy days. Happy Shooting! What a beautiful post! I love winter photos as much as your walk! Marvelous, winter to summer, it's almost as if I was with you. Brilliant series. Your photos are beautiful, Reena. You are working magic with Topaz Adjust HDR and Nik HDR! 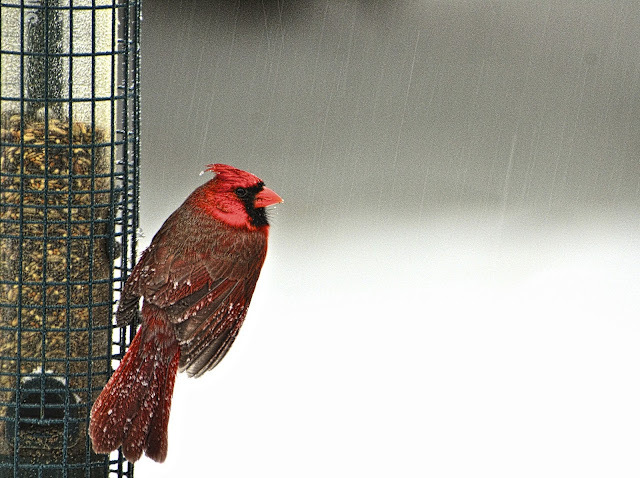 love love love that 1st Cardinal shot... they're all beautiful, crisp & clear, but I love the 1st w/ the snow! 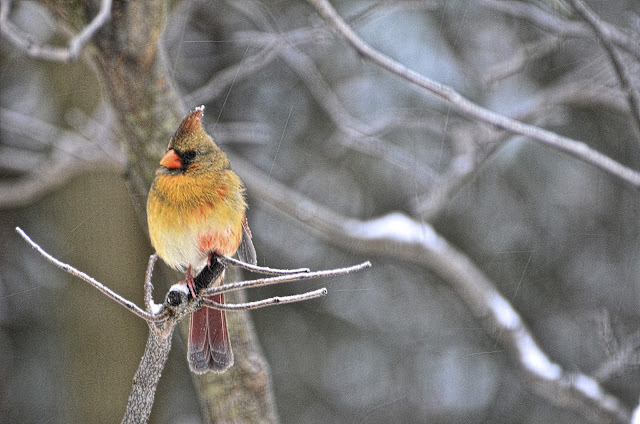 Love the Cardinals in the snow!! OK these are great and (I"m scrolling backwards) I see where you are now. I adore cardinals too (we're from Oregon originally) and there are none in the Northwest. Enjoy the rest of your vacation. Gorgeous shots of both locations Reena! That Cormorant photo with the green background is absolutely awesome! What a lovely pause in my morning to discover your blog for the first time. What a lovely visit I've had... your photography is wonderful. I love birds and so I'm really captivated by your gallery of finely feathered friends.